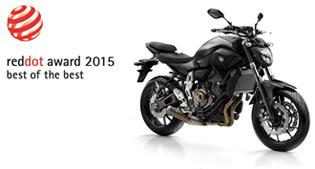 MT-07' and 'JWX-2' Selected as 'Best of the Best' Three Products Chosen for the German Design Award 'Red Dot Award 2015' - News Releases | Yamaha Motor Co., Ltd.
IWATA, March 30, 2015 – Yamaha Motor Co., Ltd (Tokyo:7272) is pleased to announce that its MT-07 large motorcycle model, JWX-2 power assist unit for wheelchairs, and TRICITY Leaning Multi Wheel (LMW) have received the globally-prestigious 'Red Dot Award: Product Design 2015'. Among them, the MT-07 and JWX-2 were selected as the 'Best of the Best', awarded to particularly distinguished designs among recipient products. Since 2012, Yamaha Motor products have now received 'Red Dot Awards' for four consecutive years, but this year is the first 'Best of the Best' selection. The 'Red Dot Awards', organized by Germany's Design Zentrum Nordrhein Westfalen, are global design awards in which products with designs of outstanding quality are selected annually. In the 2015 Awards, a total of 4,928 items were submitted by 1,994 companies and designers from 56 countries around the world. Of them, 1,240 items received awards, and 81 among those were selected as the 'Best of the Best'. The JWX-2 applies the power assist system technology from Yamaha's PAS electrically power assisted bicycles to wheelchairs, to create a power assist unit that adjusts the level of assistance based on the wheelchair hand rim input load. It can be installed on a variety of wheelchair shapes, and features the dedicated 'JW Smart Tune' software, which allows detailed setting of assist force, response, linear advancement capability, left-right balance, etc. to suit the user's condition.